As published on Techcrunch today, I am delighted that Balderton are leading the $1.2M seed funding round for Dinghy. 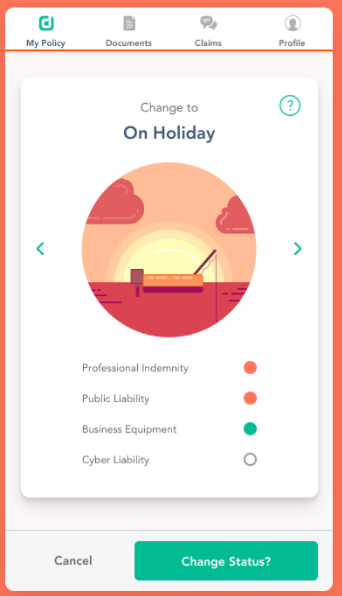 Dinghy provides the first flexible indemnity and equipment insurance for freelance professionals. Freelancers can dial up and down their coverage (e.g. between projects), with the security that they are fully covered at all times. As with any investment we make the the main reason we invested into Dinghy was the team. Ben, Rob & Ed have a rare combination of extensive experience across insurance, tech startups and as freelancers. This includes some of the stand out successes in UK insurtech of the past decade, Simply Business and Acturis; and a combination of deep tech and insurance expertise. This has allowed them (together with ReSolution and Beazley) to tailor a unique insurance product that truly meets the needs of today’s freelancers. This was a rare occasion where Balderton invested at seed stage rather than our usual Series A. Why did we make the exception in this case? A sector where we have real conviction and knowledge. I have been looking in depth at Insurtech for several years and so have more willingness to invest pre-traction. An underserved market which is growing rapidly. Existing insurers, with their annual premiums and high cost manual policy changes, are not able to effectively serve the ‘gig economy’ who work in more flexible ways. Our prior investment in Zego addresses the insurance needs of another large segment of this market, delivery drivers. Dinghy in turn go after the ‘white collar’ freelancers who might take two months off to go travelling, or work two days a week. A market where building a better mousetrap can result in the world beating a path to your door. The freelancer segment is one where we believe a great mobile-first product can grow exponentially through word of mouth. This is a community which talks to each other if there is a product that solves a real pain point, as can seen by the many success stories of Product Hunt. For example Revolut, which we also invested in at seed stage, has grown to more than one million customers in two years through word of mouth. Further examples include Stripe, Xero, Slack and Typeform. A product which really stands out from incumbents. A big part of the reason that Lemonade have had good early success (and raised $180M) is that they have built a great product experience. Dinghy in turn have built a product which gets people insured in less than 3 minutes and then dial their insurance up or down with one swipe. This is just the start, and Dinghy have a big 2018 ahead. We will be doing everything we can to give them the support they need.